So, I went into assembling the model with the idea that I may need to green stuff some gap in her back where the grub would be glued on…there’s no such space. You just glue it on…or not! 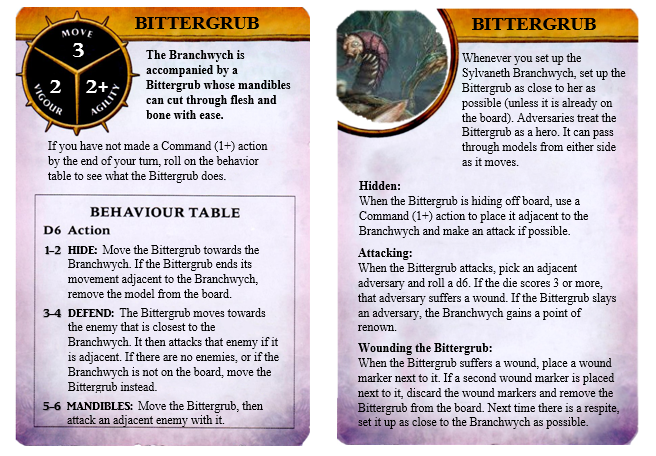 So, it was easy to find a good sized rock to have the Bittergrub scuttling over. This image of the painted fig above came out a bit more dull than I had expected. It’s hard to tell, but after sealing the models, I went back over the scythe end with gloss so it’s has a neat shiny look in person. 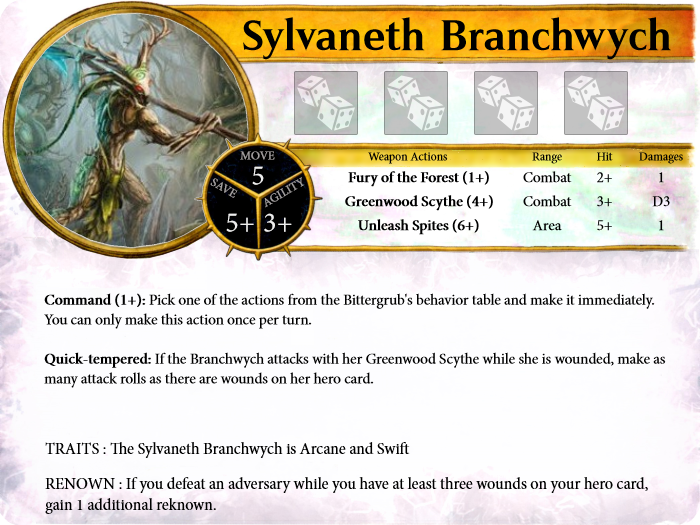 Well, being two models now the character needs a few new rules, so I’ve cooked up the following looking at the official Branchwych Silver Tower character, her Age of Sigmar Warscroll, and the Silver Tower Warpriest hero. I’ve reduced her stats, but gave her a weak area attack to reflect her more wizardly nature…using a spell she has in Age of Sigmar. 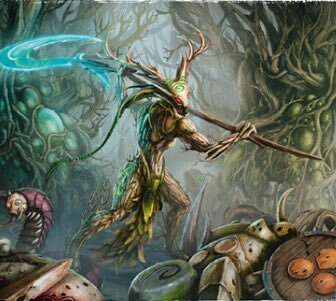 The character has had a brief, positive review from one of the Silver Tower designers, so I feel good about the build. 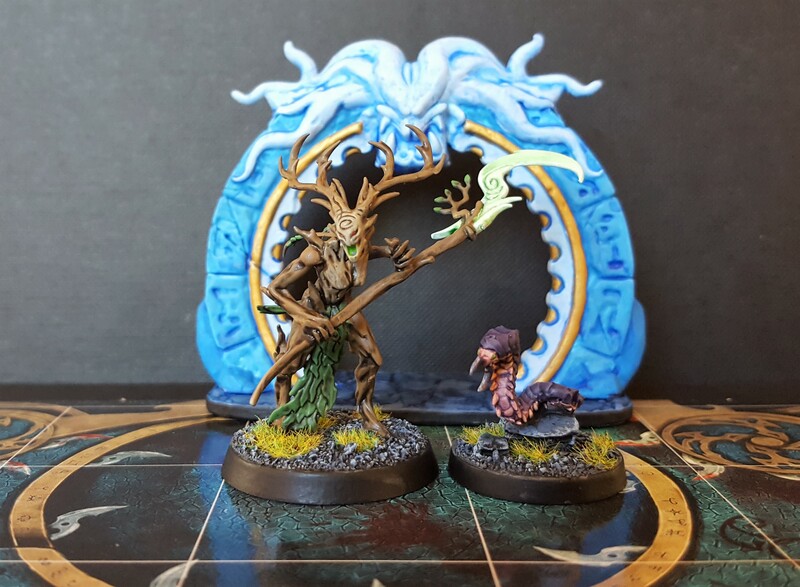 This entry was posted in Gaming, Warhammer Quest and tagged Age of Sigmar, Bittergrub, Branchwych, Games Workshop, gaming, Hammerhal, Miniatures, Silver Tower, Sylvaneth, table-top games, tabletop wargames, wargames, Wargaming, Warhammer Quest by Mr. White. Bookmark the permalink.